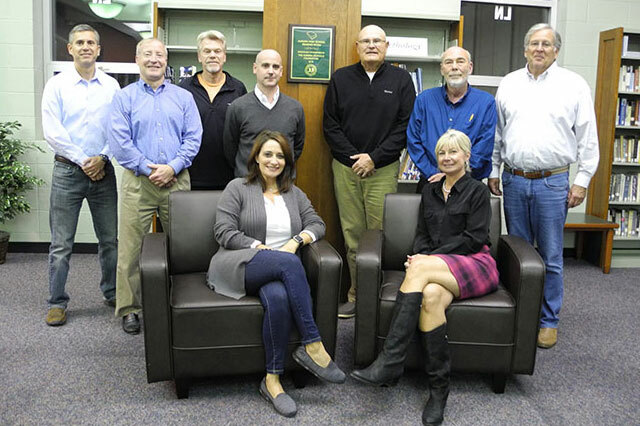 The Aurora Schools Foundation created a new collegiate style reading/small meeting area with more comfortable and inviting furniture inside the Aurora High School library. All furniture was purchased and in place fall of 2016. This was part of a greater effort to encourage increased usage of the library in general. The grant amount was for $2,837 which included 8 heavy duty arm chairs, 4 end tables with book and magazine racks, and a small coffee table. The firm providing this furniture specializes in heavy usage, durable, and discounted school furniture. The Student Council is also expected to provide some funding. Standing in the renovated reading area from left are ASF Board Trustees Kurtis Zabell, Treasurer; John Wells, First Vice-President; John Sloe; Matt Gilmore; Robert Tuttle, VP Development; Gary Brookhart, VP Historian, Grants; Tom Carr, President. From left sitting are Amy Papesh; Mary MacDonald, Secretary.